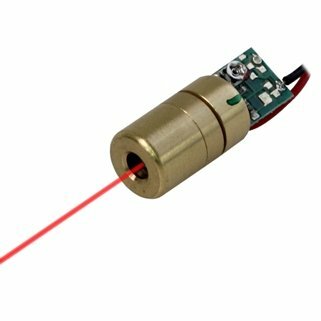 Quarton Laser Module VLM-635-02 LPT (ADJUSTABLE DOT LASER) by Infiniter at Pacs BG. MPN: VLM-635-02 LPT. Hurry! Limited time offer. Offer valid only while supplies last. APPLICATIONS: Red Dot spot - for positioning, measuring, pointing and laser sighting device. Wood processing. Metal processing. Stone processing. Wave length: 635nm. Output power: Class II - less than 1mW. 2.6~5 VDC operation. Dimensions: D10.5 x 26 mm. Red laser. Adjustable focus Laser. This module has an integrated optic, laser diode, and APC driver circuit. APC driver circuit enables constant Laser output power. Includes patented solid brass structure for the best shock resistance and better heat transfer consideration. Aspherical plastic lens provides Dot spot.